At sometime around 11.30am this morning [Jan 22] there was a shooting in the Pembroke area. Further details are limited at this time, however we will update as able. Update 12.02pm: Unofficial reports suggest that someone may have been injured. We are expecting to receive a police statement soon with confirmed details. Update 12.05pm: Police Media Manager Dwayne Caines said, “At 11.33am police and first responders attended a report of firearms incident that took place at the junction of North Shore Road and Overview Hill. “Details are unfolding at this present time, but it appears that a male riding a motorcycle was shot by another individual[s] on a motorcycle. Two suspects fled the scene on a motorcycle. “The victim was taken to the hospital where presently his condition is unknown. “The area has been cordoned off and traffic is being diverted in the area of Blackwatch Pass on North Shore to Berkeley Hill. Officers from the Forensic Support Unit and Serious Crime are now in the area and a full investigation has commenced. Update 12.20pm: Mr Caines confirms the victim is a 22-year-old man. 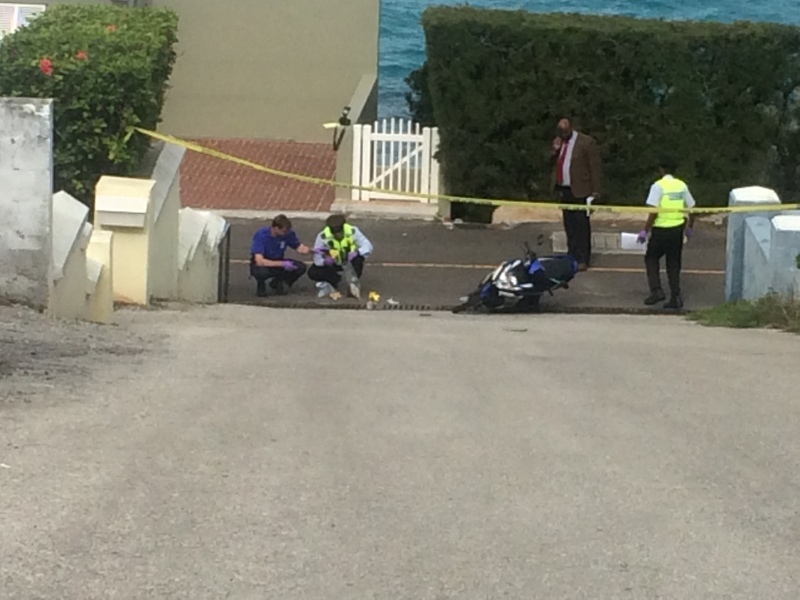 Update 12.44pm: The police have now moved the motorcycle that was laying on the ground. Update 1.41pm: Police have amended the victim’s age to 20. A spokesperson said, “At 11:33am today [Friday, January 22nd] police and first responders attended a report of a firearm incident that took place at the junction of North Shore Road and Overview Hill in Pembroke. 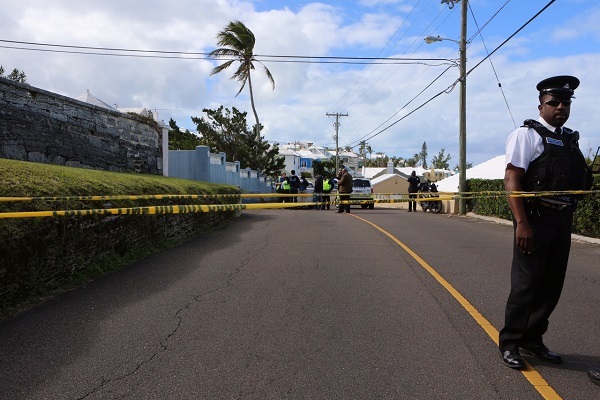 “It appears that a 20-year-old Pembroke man was riding his motorcycle turning on to Overview Hill when two males on another motorcycle rode next to him and opened fire, before leaving North Shore traveling east. “The victim was taken to the hospital and his condition is unknown at this time. “North Shore Road between Blackwatch Pass and Berkeley Hill has been cordoned off whilst the scene is being processed by the Forensic Support Unit. “A full investigation into this matter has commenced and the lead investigator is Acting Inspector Jason Smith. Update 2.56pm: A police spokesperson said the victim “is in serious condition in the ICU” at KEMH. Always a choice – civil resolution or un-civil resolution. The Courts are of little help to those who want to be civil – let these chaps have a go! Let’s get off our knees and pray. Work needs to be done in the black community. We are coming apart. I suppose that’s it statistically likely that it was a shooting involving blacks, but the ethnicity of those involved has not been disclosed. Get off our knees or on our knees? Work needs to be done in the community in general, not just the “black community”. Furthermore, who says the perpetrator or victim is black? They just may be… but that’s a sad presumption mate. If parents were parenting instead of praying then perhaps these thugs would have a moral compass. God does nothing, may he strike me down dead now if I’m wrong!!!!!!!! If you havent dropped dead yet, might be someone praying for you mate. Gods doesnt have human rationale, therefore he doesnt need to prove to you how mighty He is, by striking you down when YOU demand it. Nah, I’m fine, I guess God agrees with me. No surprises there. This country makes it hard to care for children because most parents have to work instead of care for there children. NO my friend, Prayer changes things. a sad presumption? your funny, what are you trying to do be a smart a%$? ,, where are the problems in the white community? The white community has problems, they just deal with it different plus they don’t have the Historical and present social issues as Blacks. Hey “PREACHA” don`t you think its time you took off your blinders man and see whats in front of you ?? Holy SMOKES man you cannot be serious right now !!! Could be Mate, But of the 33 murders, How many do you think where WHITE? It makes us feel good to say it’s a community problem. BERMUDA IS DIVIDED UP INTO TWO COMMUNITIES. The black community is coming apart. Wake up and see what’s going on around Bermuda, MATE. Pray for a solution???? That’s what the Republicans say every time that there is a mass shooting in the US – has not stopped anything yet. Let’s have some real solutions please, not hocus pocus…. Bermuda’s crime rate, shootings, per capita (Bermuda about 64,000 people, compared to America’s with about 310 million people)is higher than America’s mate. Plus where there is a high percentage of legal gun owners the crime rate is a lot lower than where there are “no gun” zones. So, you can preach all you want. You are entitled to your opinion but not your facts. Try praying that you can buy a house with no money down – see if that works. Actually Ed, it has happened. I know because it happened to me. ED , Is that you again. I ‘ve bought many homes with no money down. Additionally, I’ve helped over 500 people to become home owners. Well Rodney , there is praying and preying . Old men can usually only pray that young men don’t prey on them ! It’s time to STOP this nonsense. So sick of these Cowards!!!! Does anyone have cameras in the area? HEY BLOWMYFISH ITS COMMENTS LIKE YOUR THAT KEEP US FROM HEALING AS A COMMUNITY. the make us angry and they are IGNORANT. ILL HAVE YOU KNOW THAT US BACK OF TOWN PEOPLE HAVE LOST sons fathers etc to this crap so keep ya jokes to ya dam self cause they are not funny. HEY BLOWMYFISH ITS COMMENTS LIKE YOUR THAT KEEP US FROM HEALING AS A COMMUNITY. I’d really love to know what prompted that response. Preventing us from healing ? ? Please explain . I thought blow’s remark was quite funny and nothing at all to do with some sinister community healing issue . I think everyone here will pass on that offer! You all seem to make jokes on peoples comments. At the end of the day someones life could be gone, or fighting for life, it is nonsense making jokes about peopls comments. No we may not agree on the verbage used by some people but that is their opinion. hose a lifestle beyond my beliefs. When he changed his lifestyle it was too late. After 6 months of living right he was murdered. I am a God fearing women and i know prayer changes things, we also need to stand together as a community. There is not a day that i dont think about my son or endure heartache. , the violence has to stop. This is lives and families that are hurting. May Jah bless our island home. These gun men are domestic terroist. Imagine if we had a major terroist attatck here? It is sickening! A terrorist attack is highly unlikely in Bermuda. These punks with guns are the closest we will come to domestic terrorism. Real men use fists to dissolve a situation, hence why I call them PUNKS! As long as the innocent aren’t harmed let these fools do us all a favor and off each other!!! Ain’t no social programs or intervention gonna save these fools!!! Looks like they rob the gas station to rent a gun. This is a great time to reduce the size of the Police Service. You are doing a great job keeping the moral of the officers low. While you are at it, take away their benifits. The police will definitely continue to put their lives at risk and fight this gun violence head-on knowing that they would have to pay if they get injuried. Wow!!!! our country is a safe place. Arm robberies, gun play every day and unhappy police officers. OR, WE CAN TEACH OUR SONS NOT TO KILL EACH OTHER. You are dopey. Last time I checked, one CHOOSES to become apart of the police force and have to assume that there will risk and danger associated with the job! And if they’re unhappy with their “lower-than-the-rest-of-the-island’s deduction” paychecks, they should quit! Correct me if I’m wrong, but weren’t we assured that the CCTV system has been installed island-wide? If this is the case, what is the problem? I remember hearing that only those within the city of Hamilton were actually manned, while the others recorded. Why has no one been caught using these cameras? Warwick robbery…White Hill robbery…Happy Valley shooting…the list goes on! maybe because people who commit these crimes keep their identities covered up with visors/masks/dark clothing/bikes without registered plates….if it were that easy we wouldn’t need police we would just have camera everywhere. lets think before we just say ANYTHING…. Not saying that camera’s would solve the crimes, but it would be a starting point. Maybe someone would recognize the build of the individual and actually be willing to come forward…or someone could recognize the bike used!!! Only asking a question!!! How is it that absolutely no one manages to see or have any further information to provide to the appropriate authorities? The knowledge of who these criminals are is without-a-doubt known on the island by someone or perhaps even a group – and none of them chooses to speak out…As almost as important as it is to catch and charge these criminals, those that stay silent are also aiding and contributing to this unrest. This is not a political problem nor a religious one, it’s not a black problem and it’s not white problem – this is a Bermudian problem and the sooner we contribute to the well-being of our society as a whole, as one family then the change can and needs to begin. Here we go again absolutely no regard for human life.. These thugs are only interested in “cowboy justice” for perhaps some silly slight. May God show them the same mercy that they visited on that young man. Well what we actually got is even more shootings when the UBP/BDA/OBA was elected … Now the only thing to do is to wait for the guy to take a picture and give empty speeches . Funny because most of the shootings occured under your beloved PLP/BIU/UBP group. And guess what followed……..EMPTY SPEECHES! What a bunch of trash. The reason these punks are doing this, and it dosen;t matter if we have CTV cameras because they wear helmets, masks or whatever to cover their faces, is because of the drug world. Plain and simple, Territory etc. It’s like living in Chicago, the rates of killings have double within the last few years. I am so afraid that a child will be hurt while they ride by shooting. God help us! Why Jeff Barron and dunkely ain’t on the news tonight like four star pizza? Strange. They was their the next day. The only people responsible are the ones who decided today to take a gun and go shoot somelone else …..their choice their decision and only the 2 gun men are responsible for this crime ….put the blame where the blame lies….not the OBA or the PLP. ……. MUSIC INDUSTRY GOT EVERYONE THINKING THEY GANSTA, PUNK WAY TO DEAL WITH ISSUES. WHAT EVER HAPPENED TO TALKING IT OUT EVEN SCUFFING IT OUT.PLEASE I HOPE THAT MAN IS OK.
FYI: Caps Lock key is on the left side of the keyboard above the shift key. I am not sure of the quality of these cctv cameras, I will say it would be rather difficult to i d these folks if they had on helmets with full faced tinted visors and no licence plates. It is possible they knew each other. Hope-fully the young man reco vers and we need to keep the family in prayer. The police cant be every-where, this was middle of the day, over in a few secon ds. Culprits need some form of transportation, frequent road vehicle checks will result in some not wanting to ride cause they will have to show their driver,s licence, and they will certainly call each other..oh dont use that road a check point is here another there. We need to look at some of these areas in the U.S. where similar shootings have happened. Why is it in the U.S. areas of millions of people and the perps are arrested within hours or less. We are only 60,000! There must be something missing in how our Police go about doing their job. Please get some help, preferably from the U.S.! You must be young to think the US always catch their purps within a few hours. Trust me, we don’t need help from the arrogant yanks! Out of 33 comments thus far, why are there only 2 of us prepared to use our proper names? What are all of you so afraid of? Because you have nothing to lose…smh stay out of it you wouldn’t understand anyways. James, People live in FEAR. Lets be real bout this. It only going to get worst keep cutting jobs and rasieing prices what do u think is going to happen crime is going rise its not right but it happens all around the world . Our children are being push through the schools system. If the leaders of our country can’t get it right hows the people suppose get it right . We have violence in this country now but if we have political violence we diffently gone to hell. I find it funny the amount of comments people put on here it mayne the gunmen commenting aswell. We all know show doing the shootings in the town area. Only those that cant leave town to go east or west that live a boring life. This has turned out to be the worst year eva!I can’t believe the stuff that has happened already.It’s unbelievable! Nothing will change until we stop being afraid the Police can help with this. I must say I’m the least bit impressed with how my generations of peers are going on today… 23 yr old female, if I’m supposed to marry someone on this island, how can I if they’re all killing each other… It’s sad to hear of them shooting at each other and the like. Why? Because you live two parishes in the wrong direction (according to “gang territory)? It’s already a harsh ratio of more women to men, all across the world, but why must we continue the killings of our men? Why can’t we band together like the people of America & protest that the violence stop!? Although they do it because it’s the police often, we should be walking through neighborhoods as they walk the streets to let these young men know “All Lives Matter” not just black. It’s only 23 days into 2016 and look at all the crazy s#it that’s happened… Unbelievable! Some will blame the political parties, others will blame the parents, but of course it all goes back to the individual persons. No one can force you to go out & just shoot..you do it on your own terms. Psychology/sociology would say these folk are a product of their environment.. True, but it should not be. Employment, or lack there of, should not be a reason to go out and shoot someone. Drugs and gangs are overrated.. They need to be disband. We’re only so big, we should be uniting not fighting, gosh were all more than likely related. Why God put us on this small island..and these young people are “doing the most”. 9 parishes… Not 50 states… Too small for all the fuss!!!! Those blaming government, stop regardless of what the oba have promised.. Those blaming parents, STOP . Most.. Most parents do the best they can. After that, it’s the person who has to make their own choices. I lost two cousins last year, one to a gun one to a knife.. I’ll never see them again, one will never see his child. It’s so SAD! But I know their parents did their best in raising them.. What they did outside of the raising was on them, but I’ll love them regardless of it (been the saying is you die how you live). Just saying, the only people to blame are those doing it. Us as a community need to come together and help stop what we can. Walk through neighborhoods, take our young neighbors to church.. Cause that’s all they need. A little Jesus. Lastly, the education system needs to ensure that EVERY school public and private are being taught BERMUDA HISTORY not American history. Teach them about us FIRST so we can have a sense of pride about ourselves as bermudians than maybe we wouldn’t want to kill one another!!! Oh, and use the Royal Bermuda Regiment! We don’t train on vehicle checkpoints, riot control etc for nothing!! JS..